Golf carts a popular mode of transportation here, but many people have trouble remembering that Edisto Beach golf cart laws apply.  A golf cart permit must have a Department of Motor Vehicle’s permit. Permits are available from any DMV office. Owners must show proof of ownership and insurance to obtain a permit.  A valid driver’s license is required for any golf cart operator. 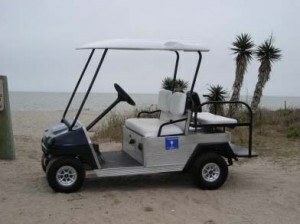  Golf carts on Edisto Beach can only be operated during daylight hours.  Golf carts on Edisto Beach can only be operated within two miles of the operator’s place of residence.  Golf carts can only be operated on secondary highways or streets. This means no golf carts are allowed on Palmetto Boulevard unless operators drive the cart directly across the street and park. Crossing the street must be done by driving straight across and not at an angle.  Open container laws and laws pertaining to operating a golf cart while under the influence of drugs or alcohol still apply. Note that these laws do not apply to low-speed vehicles. While some of these laws may seem like they are easy to fudge or outright disobey, take it from a local: Golf cart rules are enforced. Don’t risk taking an alcoholic beverage with you for a ride or let kids take the cart for a spin. Have fun with the carts, go for rides, and keep an eye out for traffic. The summer months are the busiest and Jungle Road has heavy vehicle, foot, bike, and golf cart traffic. Keep in mind that golf cart owners aren’t the only ones that get to cash in on the fun. Golf cart rentals are available from a variety of different companies.